1. Strategy mapping: Initial workshops focus on identifying identifying and addressing the outcomes required by the organisation, its service users and other key stakeholders, including value for money. The strategy map is a key output of the PSS, showing the relationships between outcomes and process and capability outputs. This is refined further after consideration of risk issues. 2. Service improvement: This involves process re-design, perhaps using systems thinking, process mapping and lean approaches, followed by addressing the capability elements to support people and processes in achieving the required outcomes. Capability elements are the various organisational, cultural and resource issues that will enable people and processes to achieve the various outcomes. 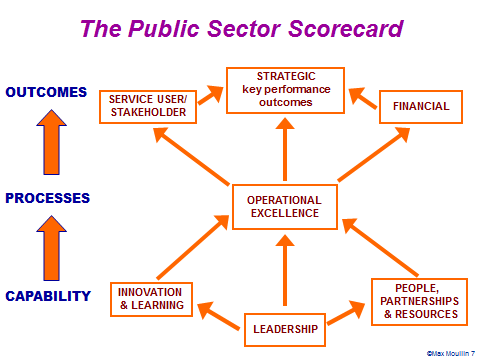 The Public Sector Scorecard is an integrated strategy mapping, service improvement and performance measurement framework. It extends and adapts the balanced scorecard to fit the culture and values of the public and voluntary sectors. It has been used in Canada, Chile and South Africa as well as the UK. The PSS focuses on outcomes – service user, strategic and financial - the processes that lead to those outcomes, and the capability, organisational and cultural factors that are needed to support staff and processes. The PSS has three phases - strategy mapping, service improvement, and measurement and evaluation Click here for more information on How the PSS works. Moullin, M. (2017),"Improving and evaluating performance with the Public Sector Scorecard", International Journal of Productivity and Performance Management , Vol. 66 Issue 4. Training, research and consultancy on strategy mapping, quality, service improvement and performance management in the Public and Voluntary Sectors. ​For more information on our services click here. ​FUTURE WORKSHOPS COMING SOON - WATCH THIS SPACE!